Published posthumously, this study of Aristotle is thoroughly rewarding and will only increase McCabe's reputation as one of Britain's finest theologians of recent years.The revival of interest in Aquinas has run simultaneously with the rise of interest in Aristotle, on whose philosophy Aquinas based his own. "On Aquinas" is a masterly work of exposition written with breathtaking clarity. 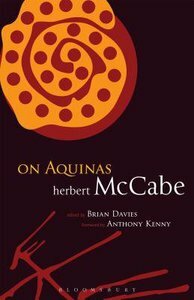 By the use of simple modern analogy McCabe really brings Aquinas' thought to life and underlines the crucial influence of Aquinas on our own contemporary thought. It is rare to find a work of philosophical exposition which is exciting to read. Even those who are unfamiliar with Aquinas will find this book gripping to read. No wonder therefore that McCabe's gifts are so greatly admired by people as diverse as P.J. Kavanagh (poet) Anthony Kenny (philosopher) Terry Eagleton (literary and cultural critic) and Alasdair MacIntyre, whose book "After Virtue" has had such enormous influence today. "On Aquinas" can only enhance McCabe's reputation. Herbert McCabe O.P. was a Dominican Friar and theologian of outstanding originality who died in 2001. He was deeply influential on philosophers such as Anthony Kenny and Alasdair MacIntyre and poets and writers like Terry Eagleton and Seamus Heaney. He was the author of a number of God, Christ and Us; God Matters; On Aquinas; Faith within Reason and most recently God and Evil. Introduction By Brian Davies; 1 The Historical Context; 2 Definitions And Descriptions; 3 The Cat And The Mouse; 4 Matter And Form; 5 The Self In The Narrative Mode; 6 Emotions; 7 Human Reasoning; 8 Knowledge; 9 Virtues And Vices; 10 Experience; 11 Imagination; 12 Temperateness.